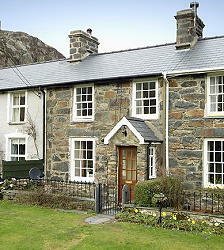 'The Cottage on the Green' is an attractively presented and well equipped holiday cottage in Beddgelert. Every effort has been made to ensure that you have the relaxing & comfortable break you deserve. This delightful holiday cottage in Beddgelert has been renovated in a traditional way with log burning stove & beamed ceilings etc but with all the mod cons for the comfort of its guests. 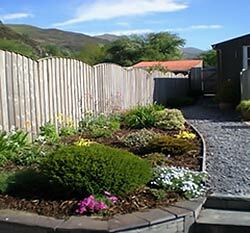 This is a perfect location for those wishing to explore Snowdonia or simply relax.
" 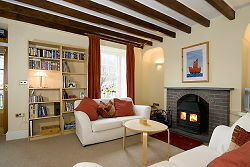 What a fantastic cosy and friendly cottage in an amazing setting. " 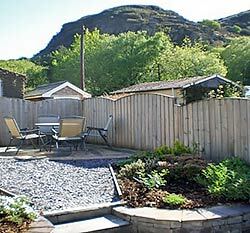 " Beddgelert is the perfect place for a holiday in Snowdonia and this lovely cottage is in the best location in the village. " " Beautiful cottage, lovely setting. A perfect base for our walking & mountain biking activities. " There is a lovely cosy lounge with a log burning stove and beamed ceiling, and all the trappings you would expect to find in a traditional cottage but with the benefit of satellite/internet TV and DVD player, and free wi-fi is available. A selection of books and dvds are available. Or you can just simply relax, looking out over the village green. 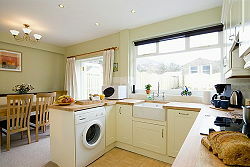 The kitchen/dining room is open plan with a very well equipped kitchen with dishwasher, washing machine, fridge and electric hob and oven. The dining area has french windows leading out to the nice garden with patio and superb views of the mountains of 'The Snowdon Horseshoe' and Beddgelert's own mountains snaking up the pass. 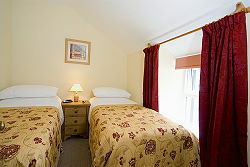 The main bedroom is a beautiful room with exposed floorboards, traditional pine bedroom furniture and the most amazing views over 'The Green' to the river and then off down the Glaslyn valley. This is a great place to just curl up with a good book on one of the two window seats. 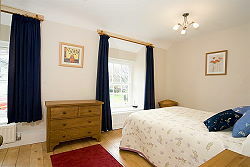 The rear bedroom has twin beds that can be linked to form a double if requested. This cosy room has stunning views of the mountains. 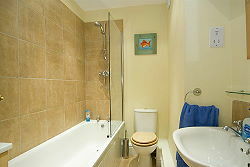 The bathroom, which is on the ground floor, features a quality combi-boiler fed Mira power shower, and a nice big bath to soak in after a hard day exploring the mountains of Snowdonia. The holiday cottage is situated overlooking the village green in Beddgelert with stunning views of the mountains & river. For more information on the area, and how to find us, see our location page.